The Oakland Press Blogs: Open Book: A Sports Blog: Red Wings need Damien Brunner, but at what cost? 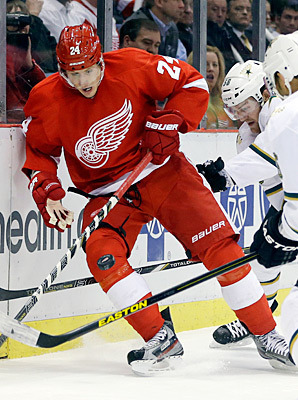 Red Wings need Damien Brunner, but at what cost? Hockey is a multi-dimensional game. It's not a one-way street. Yet, as defensive systems have become an applied science and goaltending improved to the point astounding skill, goal scorers have become a premium. Damien Brunner reminded nobody of Brett Hull in his prime as a 27-year-old rookie for the Red Wings last season, but he has the knack for scoring goals. He can, in hockey terms, snipe. 12 goals in 44 games, even if they were front-loaded to the start of the season, can't be dismissed. Neither can five goals during an intense playoff run vs. top-of-the-line competition. The Red Wings need him more than their other unrestricted free agents, Danny Cleary (who played surprising well in the playoffs) and Valterri Filppula, an excellent two-way player who had a surprisingly subpar season. Why? Because Brunner can score goals. But is he worth $4 million or $5 million? I know that sounds ridiculous, but look at the contract Calgary bit on for Jiri Hudler last summer (four years at $4 million per season). The Red Wings must prioritize their signings. They are in a transition phase and can't afford to have roster spots taken up for younger players who might otherwise be exposed to waivers at some point. Brunner is the priority - as long as the cost doesn't get out of hand.